Make this No Bake S’mores Bars Recipe any season. It’s easy and so tasty- No campfire needed! Whoever came up with the gooey goodness combo of graham crackers, marshmallows and chocolate is a genius. I say those three items and you know exactly what I mean- S’mores! And you probably get a memory or two flash in your mind of making these by a campfire in the chill of autumn. Make this No Bake S'mores Bars Recipe any season. It's easy and so tasty- No campfire needed! Line an 11x7 baking dish with parchment paper. 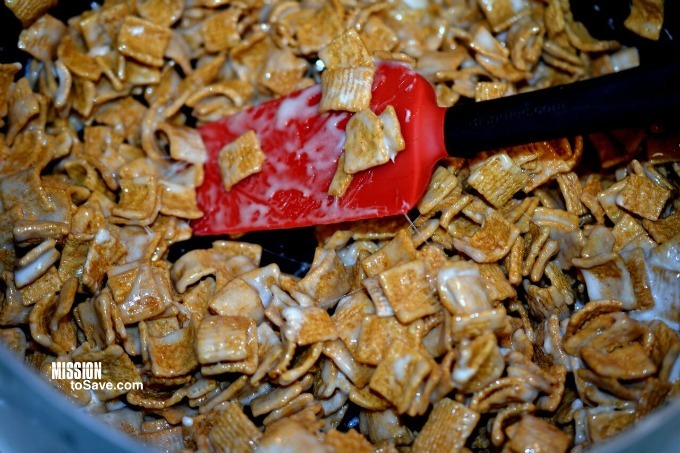 Pour the cereal mix into the dish, evenly spreading. These sound so good, but sweet! These would be great for when we’re all missing camping in the winter!